Stolt-Nielsen Limited is the world’s leading provider of integrated transportation and storage solutions for specialty and bulk liquid chemicals and a wide range of other liquid products. 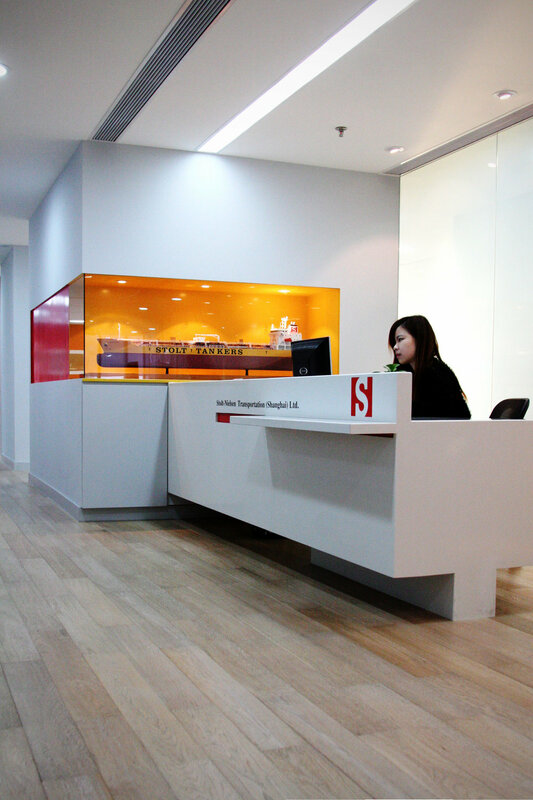 The Shanghai office is one of 33 offices worldwide and an important center for eastern-based business activities. Located on a full floor in a modern office building in the Puxi District, the recent renovation was a consolidation of various departments and personnel from different locations. Putting all the operations together involved programming issues related to space allocation and logistics of personnel. PKSB was involved with this programming along the general manager and human resource director. While there are private offices, the general plan of the office is based on an open design. An integral part of the Stolt-Nielsen work ethic is that interaction and collaboration are an essential aspect of a successful work environment. Offices, while closed for privacy, are visually open to the general work area. There is a lounge area with a ping-pong table, a very popular activity and one that generates interaction during the day. The openness of the design promotes discussion and engenders people to claim their space and align their identity with the firm.